With the dry winter months well underway, my skincare routine has been more important than ever. Maintaining a regular routine means that your skin will feel nourished and smooth – not only that but any makeup will go on much better! I like to keep my routine quick, yet still hydrating, so that my makeup will sit on my face without flaking. I start with No. 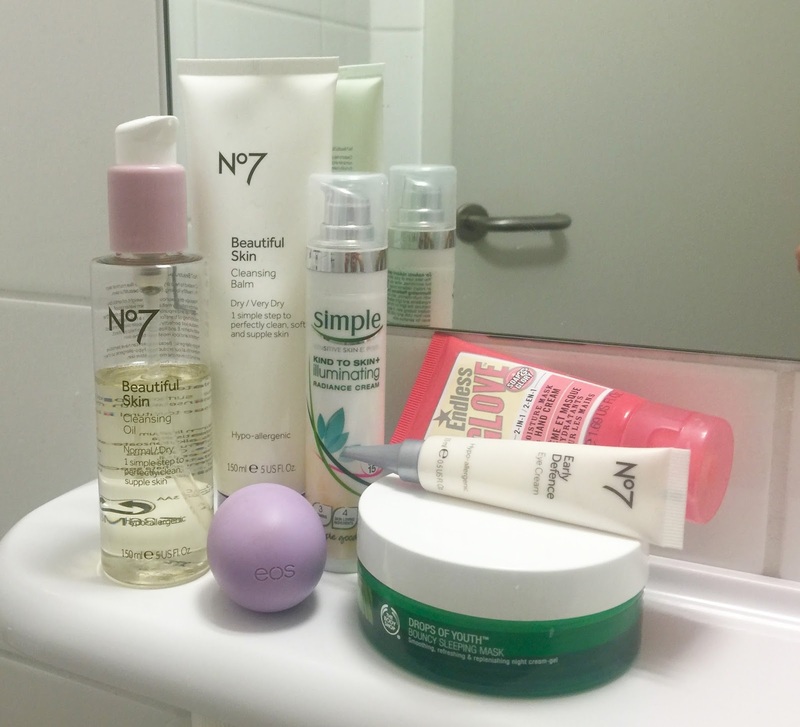 7 Beautiful Skin Cleansing Balm to wash my face. It has such a soft, pretty (yet not overwhelming) scent which is perfect to wake up to. I then follow with the Simple Kind to Skin Illuminating Radiance Cream which is a beautiful product to make your skin glow. It is filled with light reflecting minerals that capture the light and immediately make you look healthy and hydrated. It also has an SPF 15 which is always a bonus! With a little EOS lip balm I’m all set to go with applying my makeup. The evening time is where I like to have a routine that is a little more rich. Skin replenishes itself during sleeping hours and providing it with lots of moisture before bed means I wake up with smooth and supple skin. After removing my makeup, I reach for No. 7 Beautiful Skin Cleansing Oil. It’s hard to find a drugstore cleansing oil which is light and doesn’t leave an oily residue and this one is just perfect. I think No. 7 is an extremely under-rated brand – their skincare and beauty products are wonderful quality, yet are very affordable for a student like me. After rinsing off the oil, I apply The Body Shop Drops of Youth Bouncy Sleeping Mask. This is a product which I find I can only use in the winter months as it is very heavy. It has the most interesting putty-like texture and a little goes a very long way. You have to let this dry for about fifteen minutes before going to bed as it can be quiet sticky if you’ve put on too much. However, I find my skin drinks it up and looks plump and healthy in the morning. The last two steps are applying two dots of No. 7 Early Defence Eye Cream and a squeeze of Soap and Glory Endless Glove Hand Cream. That’s all – then I’m all ready for bed! What’s your winter skincare routine? Any skincare products/brand you would recommend?